EA's latest Origin sale is offering big discounts on a range of its leading franchises, including Battlefield 1, Need for Speed: Payback, Mass Effect: Andromeda, and Star Wars: Battlefront II. If you missed out on these games (or some of their associated DLC packs and season passes) the first time around, here's your chance to grab 'em cheap(er), with discounts from anywhere between 40 and 70 percent off. The sale is live now and will run until March 6, 2018. Titanfall 2: Ultimate Edition is available for just £11.66 (67% off), or you can look at the same saving for a Titanfall 2 and Battlefield 1 bundle, which can be snapped up for £26.66. 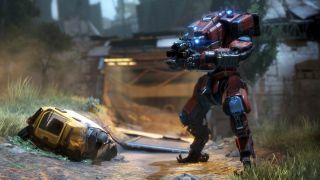 In our Titanfall 2 review, we said it was brilliant singleplayer campaign married to inventive, skill-intensive multiplayer and gave it 91, stating: "I would not be surprised if we look back on Titanfall 2 as one of the best shooters of its time." "This is a game that takes some of the most familiar vocabulary in this hobby—run, jump, shoot, spaceship, robot, alien dog—and finds ways to surprise you with each. When it comes down to it, that's what Titanfall 2 deserves to be remembered for."